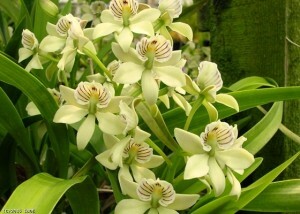 Encyclia radiata is a South American species and a natural epiphyte. I have seen them growing on trees in Belize and Costa Rica but they are very happy growing in a pot, mounted, or on a window sill. I have been growing this plant since 1999, and it is an easy grower and very reliable bloomer. This year, mine has been in bloom since April and is showing no sign of stopping. These upside-down flowers smell like honey and will perfume the room or a greenhouse. I grow mine on the northeast end of my greenhouse in a section that is without shade cloth. The tops of the plants are within 12″ of the roof and get very strong light. The greenhouse temperature ranges from 50° at night in the winter to a daytime high about 90° during summer. My radiata has survived much higher temperatures for limited amounts of time with some sunburn on leaves when “something breaks” in the greenhouse. The greenhouse waters all plants automatically every four days this time of year. The greenhouse humidity is higher than most others. This lovely plant is suitable for all growers from beginner to expert and is, in my opinion, a must for any collection. It is very temperature tolerant, and can be grown in a house or a greenhouse. Producing several new growths per year, it can be easily grown to a specimen sized plant, or kept at a desired size by dividing. 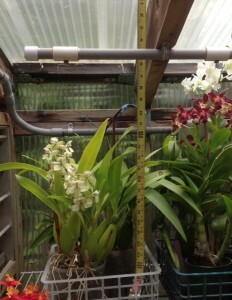 Your orchid growing friends will be delighted to receive divisions. Synonyms for Encyclia radiata include Prosthechea radiata, Ancheilium radiatum, Epidendrum marginatum and Epidendrum radiata. Growth type: Upright with spindle-shaped pseudo-bulbs and a 2-3 medium green narrow leaves on each bulb. Flowers: white, creamy or greenish colored that present upside down with a cockleshell-shaped lip. They smell delicious!! Bloom season: In Tucson, late spring into summer. Growers often list this plant as blooming from September to winter. Re-pot: After blooming when new growths appear and new roots are about 1/2″ long or when plants are growing over the edge of the pot. I have found that plants are happier when re-potted yearly. Divisions containing about four pseudo-bulbs will produce a nice-sized plant.